A 74th minute strike from Domnail Flynn was enough to see Terry Hyland’s Leitrim side over the horizon as they remain unbeaten and on course for gaining promotion to Division 3. Antrim who are yet to record a single victory are more than less confined to the ashes with their promotion hopes gone up in flames. 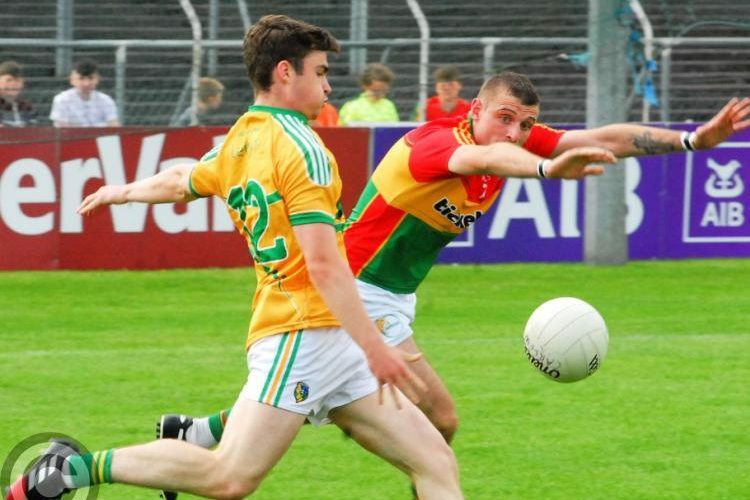 Leitrim along with Derry are the one two team left with a hundred percent record in the league, and this game highlighted the close nature of the games in this division. Leitrim were on a high after back to back wins over Wexford and Wicklow, and with a spring in their step, even though they were facing the stiff breeze points from Ryan O’ Rourke and Jack Heslin set them on their way. Ryan Murray opened Antrim’s account in the 4th minute, and they were then boosted when Colum Duffin slotted home for the opening goal. Both teams went on to trade point for point and the short whistle Antrim were in front by 1-6 to 0-6. Leitrim came out of the blocks in the second half at a hundred miles an hour with the wind assisting them and were quick to take advantage with Darragh Rooney splitting the post and when O’ Rourke chipped in with a delightful score they were within the minimum. Antrim were quick to reply when the accurate Fitzpatrick carved through the Leitrim defence to blaze the ball over the bar. A Domhnaill Flynn point reduced the margin down to one but a 35-metre free which was sent over the bar by Mc Bride secured Antrim’s two-point lead. Credit must go to both teams for a very exciting game of football, and it was looking like it was going to be a share of the spoils before the home side took full advantage of the four minutes of added time. When Flynn’s point sailed directly between the posts that was enough to ensure that Leitrim would hold onto their unbeaten record can anyone beat them. Man, of the match goes to Ryan Murry who contributed 6 points. Team Antrim Padraigh Nugent, Patrick Mc Cormac, Ricky Johnston, Patrick Gallagher, Niall Delargy, Michael Mc Carry, Declan Lynch, Mark Sweeney, Martin Johnston, Kevin Quinn, Stephan Beatty, Patrick Mc Bride, Colum Duffin, Ruari Mc Cann and Ryan Murry.